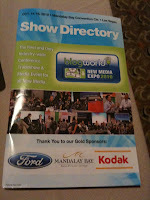 I’m at BlogWorld this week. As an avid blogger and someone who has experienced the amazing impact blogging has had on my own professional career and personal relationships, I love what blogging means to social media and in an age where everyone talking social media usually talks Facebook and Twitter we are all reminded, here at BlogWorld, that blogging is a major, major part of social media. But this is an automotive marketing blog and like any good blogger I better know my audience and you didn’t come here to hear me wax poetically about social media; instead, I’m going to talk about a brand I have an affinity for – Ford. As a Gold Sponsor, Ford is everywhere. They are one of three Gold Sponsors with the other two being Mandalay Bay and Kodak. Of course Scott Monty (@scottmonty) is here and so are some people from the Ford social media team including Brian McClary (@brianmcclary). The brand is present with large Ford logos throughout the building on several posters that communicate the way to rooms and featured behind speaker panels. The program everyone carries also has a healthy Ford logo on the cover. Where it gets interesting is with Ford’s experience approach to social media. One of the things Ford does very well is create experiences with their products in a way that gets people talking – and blogging – about their immediate reactions with the brand. 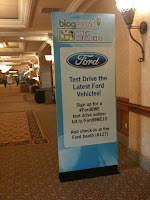 To do that at BlogWorld, Ford is hosting test drives with a full range of vehicles. Yes! I finally get to drive the new Mustang GT 5.0. BlogWorld brings together an audience that loves to publish, by definition everyone here is a self-publisher, and here Ford is tapping into that natural instinct with conference attendees and they don’t need to do it with win a free trip or here is $5,000 for the best uploaded YouTube video; instead, the community responds by participating and then sharing their experience. This is true User Generated Content. The test drives are being done via registration using the social media tool PlanCast and Tungle.Me. Both are simple applications that use existing social media log-ins (Facebook and Twitter) where people can “Count Me In” or sign-up for a specific date and time appointment. Unfortunately I attempted to drive a Mustang GT 5.0 but failed. When I went down for my allotted time someone took another half hour in the car and I was tired of waiting so I decided to come back the next morning, but didn't get a chance then as the morning ended up being fairly busy. Ford did one other thing I noticed Saturday morning. 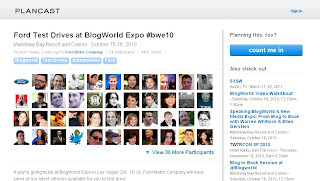 They decided to use a Promoted Tweet in the #bwe10 Twitter search thread. 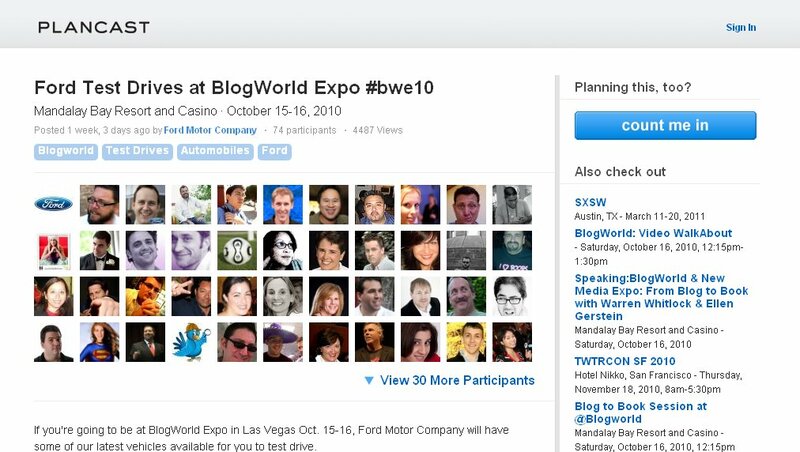 What this does is anyone following the hashtag #bwe10 (BlogWorld 2010, in case you didn't get the meaning) will see the Promoted Tweet on the top of all Twitter searches for that hashtag. 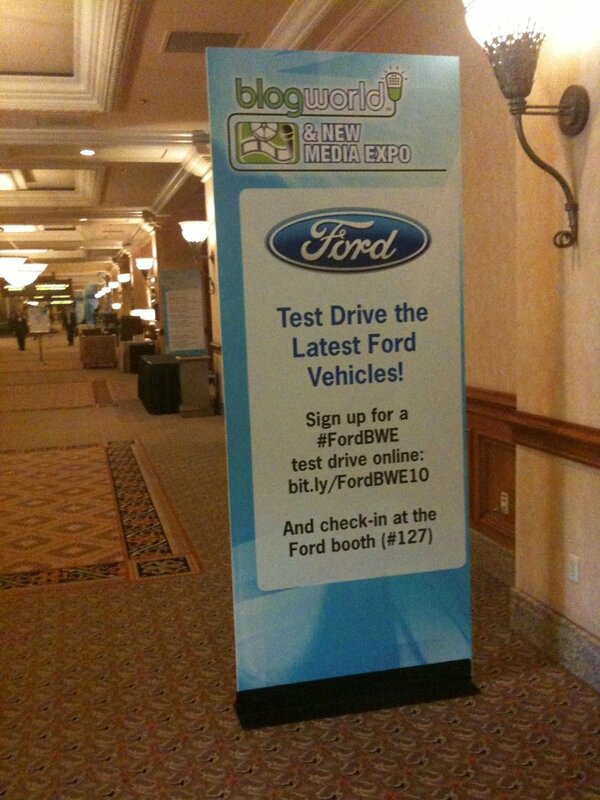 I personally liked this approach since conference attendees are the ones most likely following the hashtag and it gave Ford an easy way to remind event goers that they were holding test drives at BlogWorld. Full disclosure: I used to work for Ford at their Agency of Record Team Detroit doing Digital Marketing Strategy, but left there three months ago. I was not involved with this event or any of its planning before I left. I am very disappointed n you. Giving up the chance to drive the new Ford Focus and instead wasting your test drive on the new Mustang GT 5.0 Yawwwwwnnnnnnn. No update on the Mustang GT test drive? That doesn't mean you fireballed it, I hope. Great idea by Ford to get bloggers to write about their products. Curious to hear what else they're doing there. Unfortunately I didn't get a chance to drive the Mustang GT. I did go down to the test drive but someone was out for quite a long time with the car and I had to get going and was hoping to return Saturday morning but didn't get a chance. 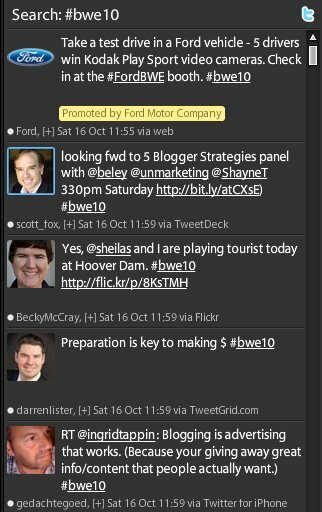 I just added another part to the story that shows how Ford also placed Promoted Tweets to get conference attendees interested in participating in the drives.